Whether you’re worried about staying up to date with the latest Google algorithms, or you simply want to remain one step ahead of the competition, SEO is a critical component of your online business. Search engine optimization is the practice of making changes to your website and the content you share based on the algorithms search engines use to rank the links shared on the search engine results pages. The better your SEO strategy, the more likely it is that you’ll appear on the first page of Google. Of course, since many different factors can affect your SEO ranking, it’s incredibly difficult to keep, enhance and optimize your online position without a little help. The term “SEO tool” can refer to anything that helps you improve your search ranking, whether it’s a system that tracks your backlinks, a strategy to help you choose keywords or a solution that grades the performance of your website. Here, we’re going to look at some of the top tools for DIY SEO available, and what they can do to help you drive stronger results from your SEO strategies. Probably one of the most popular SEO tools on the web today, Ahrefs is second only to Google when ranking the top website crawlers. If you’re looking for a way to audit your website and make stronger keyword decisions, then you can’t go wrong with Ahrefs. The tool will automatically highlight which parts of your website need improvement, so you can work on getting the best rank, for the lowest possible investment. Ahrefs can also help out with your competitor analysis practices too. With this tool, you can find out where your competitors are getting backlinks, to help you begin building your brand. You can also use Ahrefs to find the content that gathers the most links in your niche. With Ahrefs, you get a fantastic tool for finding high-performing keywords in your industry, as well as one of the most comprehensive backlink analysis tools in the market. With a few clicks, you can create a complete profile of any URL or website, all the way from the links and anchors, to the strength of the backlinks. You can even use Ahrefs when you need a little inspiration for your blog posts. Mobile readiness: The tool will check whether your site is mobile-friendly and responsive in terms of view settings. Performance: The Hubspot Website grader will determine if your website is fast enough, easy to use, and ready to provide a great experience for customers. SEO: The website grader determines if your website is easy to find, both from a search engine and human perspective. This insight takes things like meta descriptions and page titles into account. Security: HubSpot also looks for things like SSL certificates which demonstrate the authenticity and safety of your site to users. 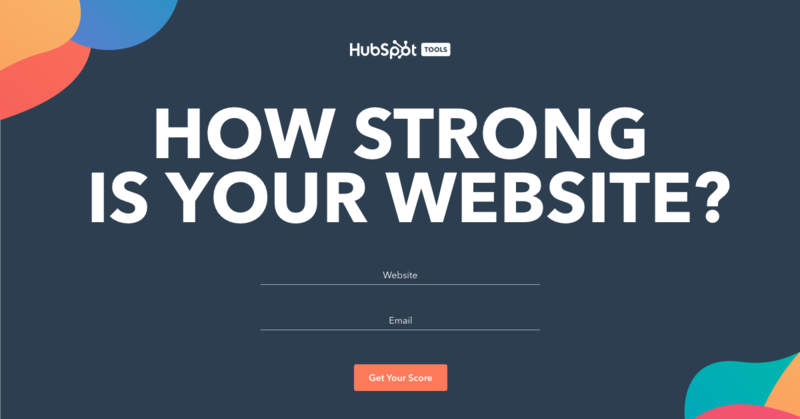 The HubSpot website grader is incredibly easy to use, all you need is an email address and an URL to get started, and you’ll get a score of between 1-100 to accompany your detailed report. One of the features that search engines look for when ranking a website according to SEO is the presence of authority links. Any broken links in your content can bring down the authority of your website, and make you look less professional. With Check My Links, you can check all of the links on your pages instantly, without any time-consuming clicking. The tool immediately scans through the content on your website pages and highlights any broken links that might not be leading to the right website. Links that work are highlighted in green, while broken links appear in red. This tool makes it easy to fix any issues you might have with your linking strategy. Where better to turn when you need help with Search Engine Optimization than the biggest search engines in the world? Google Search Console provides a fantastic way for beginners to get access to key SEO metrics. The arsenal of tools available through Google allows you to view URLs in your website map in the same way as the search engine. This is a very simple way to troubleshoot poor SEO on your site. The “PageSpeed Insights” tool also allows you to perform speed checks into the mobile and desktop versions of your site to make sure that you’re offering your customers a competitive experience when they visit your pages. On the other hand, the “Structured Data Testing” tool allows you to make sure that you’ve implemented all of your data correctly. Google also generously offers support through professional guides available through Google Hangouts. A full set of SEO tools combined into an easy-to-use dashboard, SEMrush’s SEO kitis perfect for helping you to analyze competitor metrics, access information from a robust dashboard, and upgrade your online performance. Originally designed back in 2008 by SEMRush, the SEO kit comes with features like a keyword research tool, which you can use to access detailed keyword reports for any domain that you might manage. Your SEO toolkit will even give you the option to compare the performance of your pages against domains owned by the competition. There’s a “traffic analysis” section on the SEMrush toolkit that can also be helpful when you’re looking for ways to boost the number of visitors coming to your site. By identifying the main sources of traffic that your competitors use, you can also uncover inspiration to boost your own site’s performance. SpyFu is an SEO tool available in both a free and premium version depending on how much you can afford to invest in your online strategy. If you’re just getting started with SEO, then you should be able to uncover a lot of insightful information about your website simply by using the free tier. As your business begins to grow, you might consider looking at the paid tier later on. With SpyFu, you can find useful details like, how many times a keyword gets searched for each month, and how difficult it might be to rank for that keyword. You can also enter the URL of a competitor website to find out which keywords they’re ranking for too. SpyFu provides plenty of information on everything from the number of organic keywords you have on your site, to how many clicks those words are getting, and which AdWords campaigns your competitors are currently running for those terms. 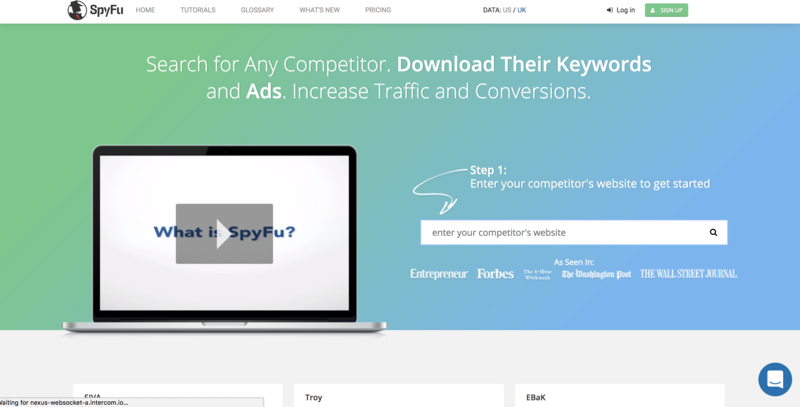 SpyFu is easily one of the most detailed analytics tools for SEO on the market. Another great SEO tool for site analysis, WooRank provides an in-depth overview of your website, featuring opportunities where you might be able to work on your search engine optimization. The WooRank analysis considers a host of different factors when analyzing your website, including the performance of your current SEO, the usability of your website, and your social media campaigns too. In total, there are more than 70 metrics that you can check out with WooRank, which means that there’s a good chance you’re going to find at least one or two ways that you can stand to improve your SEO strategy. Additionally, you can download your review as a branded PDF, which is great for when you want to show off your SEO ROI to the rest of the team. The Varvy DIY SEO tool is specifically designed to help you audit and improve your website with search engines in mind. The resource provides a full report of information about your domain strength, image SEO, social mentions and share counts, and more. You can even find out how your technical SEO is doing with a look at page speed and usability. The detailed overview that Varvy provides is what makes it such a compelling DIY SEO tool. You can determine in a matter of minutes whether your images are stopping you from getting a higher ranking, or there’s a problem with your security that’s sending customers running in the opposite direction. 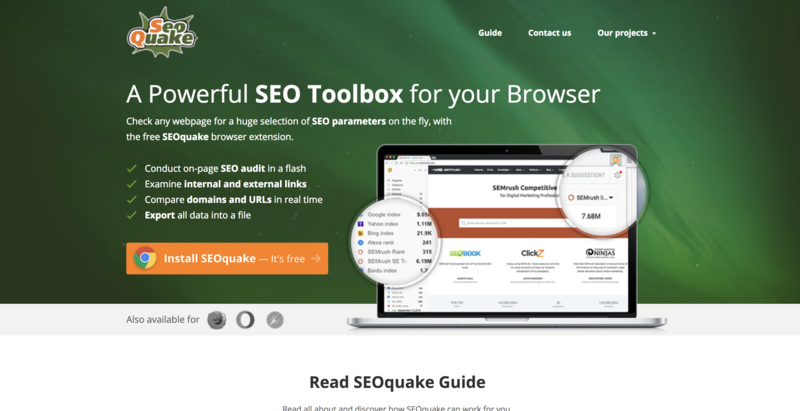 Even though it’s free, SEOQuake is still widely considered one of the best SEO tool on the market. This unique SEO solution isn’t a tool that you download, but a browser extension that you can add to your Google Chrome set-up. Essentially, it checks instant SEO audits on your website pages as you move through your website, helping you to figure out what’s going well with your current SEO campaign, and what you need to change. Finally, we all know that content is king – particularly when it comes to getting the most out of your SEO campaigns. Unfortunately, duplicate content on your website can end up damaging your ranking and your reputation too. Duplicate content is any information on your site that’s identical to the information provided by another website. How your website compares to other websites in your niche. Ultimately, there’s no one-size-fits-all SEO tool that’s perfect for everyone who needs help learning how to speak the language of the search engines. As new algorithms come into play, new tools and strategies will emerge to help you understand how to create the right content for both your target audiences and the Google bots too. However, it helps to start your SEO strategy with at least some of the tools outlined above. Whether it’s a keyword tool that helps you to figure out which terms you should be trying to rank for or a link tool that eliminates any broken links in your content, make sure that you’re accessing all the resources you need for a great SEO campaign. The more you can learn about your website, it’s performance, and the experiences your visitors are having, the easier it will be to stay one step ahead of the competition.